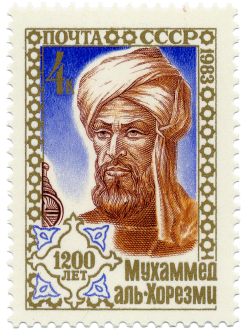 A stamp issued September 6, 1983 in the Soviet Union, commemorating al-Khwārizmī's (approximate) 1200th anniversary. Muḥammad ibn Mūsā al-Khwārizmī (Arabic: محمد بن موسى الخوارزمي) was a Persian mathematician, astronomer, astrologer and geographer. He was born around 780 in Khwārizm (now Khiva, Uzbekistan) and died around 850. He worked most of his life as a scholar in the House of Wisdom in Baghdad. His Algebra was the first book on the systematic solution of linear and quadratic equations. Consequently he is considered to be the father of algebra, a title he shares with Diophantus. Latin translations of his Arithmetic, on the Indian numerals, introduced the decimal positional number system to the Western world in the twelfth century. He revised and updated Ptolemy's Geography as well as writing several works on astronomy and astrology. His contributions not only made a great impact on mathematics, but on language as well. The word algebra is derived from al-jabr, one of the two operations used to solve quadratic equations, as described in his book. The words algorism and algorithm stem from algoritmi, the Latinization of his name. His name is also the origin of the Spanish word guarismo and of the Portuguese word algarismo, both meaning "digit." Few details about al-Khwārizmī's life are known; it is not even certain exactly where he was born. His name indicates he might have come from Khwarizm (Khiva) in the Khorasan province of the Abbasid empire (now Xorazm Province of Uzbekistan). His kunya is given as either Abū ʿAbd Allāh (Arabic: أبو عبد الله) or Abū Jaʿfar. With his full name of Abu Ja’far Muhammad ibn Musa al-Khwarizmi, historians are able to extract that he was the son of Moses, the father of Ja’far. Either he or his ancestors came from Khiva (then Khwarazm), which is a city south of the Aral Sea in central Asia. That this city lies between the Tigris and Euphrates Rivers remains under discussion. Another epithet given to him by al-Ṭabarī, "al-Majūsī," would seem to indicate that he was an adherent of the old Zoroastrian religion. This would still have been possible at that time for a man of Iranian origin, but the pious preface to al-Khwārizmī's Algebra shows that he was an orthodox Muslim, so al-Ṭabarī's epithet could mean no more than that his forebears, and perhaps he in his youth, had been a Zoroastrian. Al-Khwārizmī accomplished most of his work in the period between 813 and 833. After the Islamic conquest of Persia, Baghdad became the centre of scientific studies and trade, and many merchants and scientists, from as far as China and India, traveled to this city—and apparently, so did Al-Khwārizmī. He worked in Baghdad as a scholar at the House of Wisdom established by Caliph al-Maʾmūn, where he studied the sciences and mathematics, which included the translation of Greek and Sanskrit scientific manuscripts. When al-Khwarizmi lived in Baghdad it was quite a new city, but its location at the meeting place of trade routes from India, Persia, and ports on the Mediterranean Sea had caused it to grow rapidly. From 813 to 823, Baghdad was ruled by the caliph (spiritual and political leader) al-Ma’mun. The caliph, who himself was an enthusiastic scholar and philosopher, soon turned the city into an important intellectual center. He established the House of Wisdom and ordered his scholars to translate the classical Greek texts into Arabic. Copies of these books ended up in Muslim centers of learning in Spain and Sicily. Later, they were translated into Latin and passed on to universities throughout Europe. His major contributions to mathematics, astronomy, astrology, geography and cartography provided foundations for later and even more widespread innovation in Algebra, trigonometry, and his other areas of interest. His systematic and logical approach to solving linear and quadratic equations gave shape to the discipline of Algebra, a word that is derived from the name of his 830 book on the subject, al-Kitab al-mukhtasar fi hisab al-jabr wa'l-muqabala (Arabic الكتاب المختصر في حساب الجبر والمقابلة) or: "The Compendious Book on Calculation by Completion and Balancing." The book was first translated into Latin in the twelfth century. His book On the Calculation with Hindu Numerals written about 825, was principally responsible for the diffusion of the Indian system of numeration in the Middle-East and then Europe. This book was also translated into Latin in the twelfth century, as Algoritmi de numero Indorum. It was from the name of the author, rendered in Latin as algoritmi, that originated the term algorithm. Some of al-Khwarizmi’s contributions were based on earlier Persian and Babylonian Astronomy, Indian numbers, and Greek sources. Al-Khwārizmī systematized and corrected Ptolemy's data in geography with regards to Africa and the Middle East. Another major book was his Kitab surat al-ard ("The Image of the Earth"; translated as Geography), which presented the coordinates of localities in the known world based, ultimately, on those in the Geography of Ptolemy but with improved values for the length of the Mediterranean Sea and the location of cities in Asia and Africa. When his work was copied and transferred to Europe through Latin translations, it had a profound impact on the advancement of basic mathematics in Europe. He also wrote on mechanical devices like the astrolabe and sundial. al-Kitāb al-mukhtaṣar fī ḥisāb al-jabr wa-l-muqābala (Arabic: الكتاب المختصر في حساب الجبر والمقابلة “The Compendious Book on Calculation by Completion and Balancing”) is a mathematical book written approximately 830 C.E. The book is considered to have defined Algebra. The word Algebra is derived from the name of one of the basic operations with equations (al-jabr) described in this book. 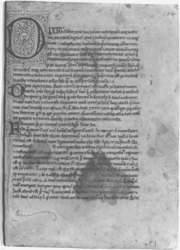 The book was translated in Latin as Liber Algebrae et Almucabala by Robert of Chester (Segovia, 1145) hence "Algebra," and also by Gerard of Cremona. A unique Arabic copy is kept at Oxford and was translated in 1831 by F. Rosen. A Latin translation is kept is Cambridge. by dividing out the coefficient of the square and using the two operations al-ǧabr (Arabic: الجبر “restoring” or “completion”) and al-muqābala ("balancing"). Al-ǧabr is the process of removing negative units, roots and squares from the equation by adding the same quantity to each side. For example, x2 = 40x - 4x2 is reduced to 5x2 = 40x. Al-muqābala is the process of bringing quantities of the same type to the same side of the equation. For example, x2+14 = x+5 is reduced to x2+9 = x. Several authors have published texts under the name of Kitāb al-ǧabr wa-l-muqābala, including Abū Ḥanīfa al-Dīnawarī, Abū Kāmil (Rasāla fi al-ǧabr wa-al-muqābala), Abū Muḥammad al-ʿAdlī, Abū Yūsuf al-Miṣṣīṣī, Ibn Turk, Sind ibn ʿAlī, Sahl ibn Bišr (author uncertain), and Šarafaddīn al-Ṭūsī. Page from a Latin translation, beginning with "Dixit algorizmi." Al-Khwārizmī's second major work was on the subject of arithmetic, which survived in a Latin translation but was lost in the original Arabic. The translation was most likely done in the twelfth century by Adelard of Bath, who had also translated the astronomical tables in 1126. 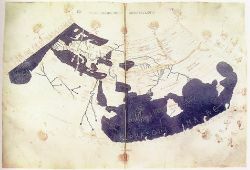 A fifteenth-century map based on Ptolemy's Geography for comparison. Al-Khwārizmī's third major work is his Kitāb ṣūrat al-Arḍ (Arabic: كتاب صورة الأرض "Book on the appearance of the Earth" or "The image of the Earth" translated as Geography), which was finished in 833. It is a revised and completed version of Ptolemy's Geography, consisting of a list of 2402 coordinates of cities and other geographical features following a general introduction. There is only one surviving copy of Kitāb ṣūrat al-Arḍ, which is kept at the Strasbourg University Library. A Latin translation is kept at the Biblioteca Nacional de España in Madrid. The complete title translates as Book of the appearance of the Earth, with its cities, mountains, seas, all the islands and rivers, written by Abu Ja'far Muhammad ibn Musa al-Khwārizmī, according to the geographical treatise written by Ptolemy the Claudian. The book opens with the list of latitudes and longitudes, in order of "weather zones," that is to say in blocks of latitudes and, in each weather zone, by order of longitude. As Paul Gallez points out, this excellent system allows us to deduce many latitudes and longitudes where the only document in our possession is in such a bad condition as to make it practically illegible. Al-Khwārizmī's Zīj al-sindhind (Arabic: زيج "astronomical tables") is a work consisting of approximately 37 chapters on calendrical and astronomical calculations and 116 tables with calendrical, astronomical and astrological data, as well as a table of sine values. This is one of many Arabic zijes based on the Indian astronomical methods known as the sindhind. The original Arabic version (written c. 820) is lost, but a version by the Spanish astronomer Maslama al-Majrīṭī (c. 1000) has survived in a Latin translation, presumably by Adelard of Bath (January 26, 1126). The four surviving manuscripts of the Latin translation are kept at the Bibliothèque publique (Chartres), the Bibliothèque Mazarine (Paris), the Bibliotheca Nacional (Madrid) and the Bodleian Library (Oxford). Al-Khwārizmī wrote several other works including a treatise on the Jewish calendar (Risāla fi istikhrāj taʾrīkh al-yahūd "Extraction of the Jewish Era"). 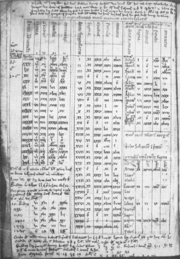 It describes the 19-year intercalation cycle, the rules for determining on what day of the week the first day of the month Tishrī shall fall; calculates the interval between the Jewish era (creation of Adam) and the Seleucid era; and gives rules for determining the mean longitude of the sun and the moon using the Jewish calendar. Similar material is found in the works of al-Bīrūnī and Maimonides. Several Arabic manuscripts in Berlin, Istanbul, Taschkent, Cairo and Paris contain further material that surely or with some probability comes from al-Khwārizmī. The Istanbul manuscript contains a paper on sundials, which is mentioned in the Fihirst. Other papers, such as one on the determination of the direction of Mecca, are on the spherical astronomy. ↑ Solomon Gandz, "The Sources of al-Khowārizmī's Algebra" Osiris 1 (1936): 263–277. ↑ Dirk Jan Struik, A Concise History of Mathematics (Dover Publications, 1987, ISBN 0486602559), 93. ↑ Abdullah al-Daffa', The Muslim contribution to mathematics (London, Croom Helm, 1977, ISBN 0856644641). ↑ Donald E. Knuth, Algorithms in Modern Mathematics and Computer Science (Springer-Verlag, 1979, ISBN 0387111573). ↑ possibly because it is mistaken with that of Ǧaʿfar Muḥammad ibn Mūsā ibn Šākir. M. Dunlop. Muḥammad b. Mūsā al-Khwārizmī. JRAS 1943, 248-250). ↑ Gerald Toomer, "Al-Khwārizmī, Abu Jaʿfar Muḥammad ibn Mūsā" Charles Coulston Gillispie (ed. ), Dictionary of Scientific Biography Volume 7 (New York: Charles Scribner's Sons, 1970–1990), 358–365. ↑ L. C. Karpinski "History of Mathematics in the Recent Edition of the Encyclopædia Britannica." American Association for the Advancement of Science (1912). ↑ J. Lennart Berggren, Episodes in the Mathematics of Medieval Islam (New York: Springer-Verlag, 1986, ISBN 0387963189), 7. ↑ The history of cartography Retrieved September 27, 2016. ↑ In al-Khwārizmī's opinion, "the Claudian" indicated that Ptolemy was a descendant of the emperor Claudius. ↑ Hubert Daunicht, "Der Osten nach der Erdkarte al-Ḫuwārizmīs: Beiträge zur historischen Geographie und Geschichte Asiens" Bonner orientalistische Studien, 1968. ↑ E.S. Kennedy, "A Survey of Islamic Astronomical Tables" Transactions of the American Philosophical Society 46(2), Philadelphia: American Philosophical Society, 1956, 26-29. ↑ Otto Neugebauer, "The Astronomical Tables of al-Khwarizmi" Historisk-filosofiske Skrifter 4(2) (1962). Dunlop, Douglas Morton. "Muhammad ibn-Musa al-Khwarizmi" Journal of the Royal Asiatic Society of Great Britain & Ireland (1943): 248–250. Hogendijk, Jan P. "Al-Khwārizmī's Table of the 'Sine of the Hours' and the Underlying Sine Table" Historia Scientiarum 42 (1991): 1–12. Hughes, Barnabas B. "Gererd of Cremona's Translation of al-Khwārizmī's al-Jabr: A Critical Edition" Mediaeval Studies 48 (1986): 211–263. Karpinski, L. C. Robert of Chester's Latin Translation of the Algebra of Al-Khowarizmi The Macmillan Company, 1915. Kennedy, E.S. A Survey of Islamic Astronomical Tables. Transactions of the American Philosophical Society 46(2), Philadelphia: American Philosophical Society, 1956. Kennedy, E.S. "Al-Khwārizmī on the Jewish Calendar" Scripta Mathematica 27 (1964): 55–59. Mžik, Hanz von. Das Kitāb Ṣūrat al-Arḍ des Abū Ǧa‘far Muḥammad ibn Mūsā al-Ḫuwārizmī. Leipzig, 1926. Neugebauer, Otto. "The Astronomical Tables of al-Khwarizmi" Historisk-filosofiske Skrifter 4(2) (1962). Oaks, Jeffrey A. Was al-Khwarizmi an applied Algebraist?. The University of Indianapolis. Retrieved September 26, 2016. Sezgin, Fuat. Geschichte des arabischen Schrifttums. Leiden, the Netherlands: E. J. Brill, 1974. Sezgin, Fuat (ed.). Islamic Mathematics and Astronomy. Frankfurt: Institut für Geschichte der arabisch-islamischen Wissenschaften, 1997-9. All links retrieved October 30, 2018. History of "Muhammad ibn Mūsā al-Khwārizmī"